BOWIE, Md. – After capturing their first CIAA championship a week ago, the Bowie State University Bulldogs (10-2) received a birth into the NCAA Division 2 Super Region 2 playoffs for the second consecutive season. This year, BSU defeated West Alabama, 41-35, to win their first ever playoff game. In the first quarter, Martin Tyriq scored on a 9-yard touchdown pass from Harry Satterwhite, to put West Alabama on the board at 7-0. At the 10-minute mark in the second quarter, Bowie State’s Jordan Crockett caught a 9-yard touchdown pass from Amir Hall to tie the score at 7-7.. Hall followed that up with a 3-yard touchdown run, strengthening the Bulldogs lead, to 14-7. West Alabama’s Jonnas Spivey recorded a 38-yard pass from Satterwhite, to tie the game, 14-all. Gene Carson connected on an 18-yard field goal, giving Bowie State a 17-14 advantage at halftime. Carson connected on another field-goal, this time from 18 yards to give the Bulldogs a lead at 20-14 at the 9:08 mark of the third quarter. At the 7:34 mark, BSU’s Bryan Ellis rushed for a 3-yard touchdown (his career first), giving Bowie State more breathing room at 27-14. The Tigers of West Alabama responded with 1:51 left in the quarter, with Tyler Rogers 14-yard score, closing the Bulldogs lead to 27-21. In the fourth quarter, Christian Saulsberry quieted the 1,531 Bowie State fans in attendance, with a 17-yard touchdown pass from Satterwhite, giving West Alabama, the 28-27 lead. However, Hall answered by running for a five-yard touchdown, giving the lead back to Bowie State, 34-28. With 9:08 remaining on the Bulldog Stadium scoreboard, Roger Richardson intercepted a UWA pass and returned it 36-yards, putting Bowie State up, 41-28. 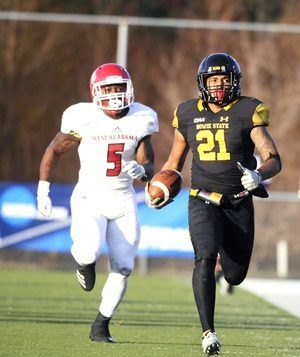 Tyler Rogers scored from two yards out at the 5:09 mark of the fourth quarter, to narrow Bowie State’s lead to 41-35, but fortunately for the Bulldogs, the clock ran out on West Alabama as the Bulldogs claimed the victory and advanced to the second round for the first time in school history. Hall finished the game completing 31-of-48 passes for 360 yards and one touchdown. He also paced Bowie State in rushing yards with 51 and one score. Crockett had a BSU personal-best day, leading all receivers with 131 reception yards on seven receptions and one touchdown. Lansana Sesay matched Crockett’s receptions (seven), tallying 86 yards while Gilbert Lunsford added five catches for 50 yards. On defense, Tre’von King recorded a game-high 10 tackles followed by Richardson with seven and Tevin Singleton with six. Thomas Riddick and Derrick Tate recorded five tackles each. As a defensive unit, Bowie State recorded 62 tackles, one sack, and three interceptions. Satterwhite led West Alabama (8-4) on offense with 289 passing yards while Rogers accounted 55 rushing yards and scored two touchdowns. West Alabama’s Qua Boyd was the teams’ reception leader with 97 yards on eight catches. Danny Rambo paced West Alabama with seven tackles while teammates Terry Samuel and Jordan Jones were responsible for six and five tackles in the loss. With the win, Bowie State advances to the second round to face top-seeded Valdosta State next Saturday in Valdosta, Ga.
HBCU fans may remember Valdosta State as the team that denied Winston-Salem State a national championship in 2012.